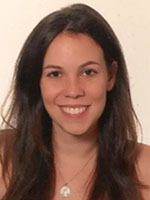 Andrea I. Pitillas Martinez joined IMEC as an Early Stage Researcher founded by the European Union’s Horizon 2020 Research and Innovation program to obtain her PhD in the Energy Storage department. In 2015 she received her BSc in Nanoscience and Nanotechnology from Universitat Autonoma de Barcelona. Later, Andrea was awarded her MSc from Universite Picardie Jules Verne after completing an Erasmus Mundus in Energy Storage and Conversion in the following universities: Aix-Marseille Universite, Warsaw University of Technology and Universidad de Cordoba. During her master thesis at CIC Energigune, she focused her research activities studying the influence of the electrode formulation on solid state batteries performance. After graduation, she worked as Technical Assistant for Batteries at Cambridge Display Technology. Nowadays she is currently working on her PhD developing hybrid coatings by MLD to potentially improve the cycling performance of high voltage solid state batteries.